The evolution of virulence is a fascinating topic, because it illuminates the fine line between a microbe killing a host and finding a new one to infect. This week I stray from the usual subject to explore a study of bacterial virulence, which provides concepts that are relevant to viruses. 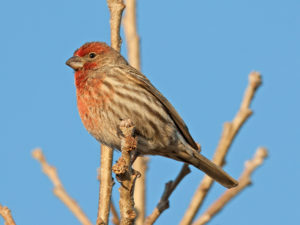 The bacterium in this study is Mycoplasma gallisepticum, which emerged in the 1990s as a new pathogen of the house finch Haemorhous mexicanus (pictured: image credit). Infection leads to conjunctivitis, which impairs the birds’ abilities to escape predators. Half of infected birds recover, but they can be reinfected. Soon after the pathogen emerged in the US, its virulence increased. The authors hypothesize that incomplete immunity drives the evolution of mycoplasma with greater virulence. To test this hypothesis, house finches were exposed to M. gallisepticum of different levels of virulence, a property expressed as pathogen load, or bacterial DNA quantified by polymerase chain reaction. After 8 weeks recovery, the birds were reinfected with the same mycoplasma strains, of greater or lesser virulence. Both virulence (pathogen load) and conjuncitival lesions were measured after the second exposure. The results show that any previous exposure to M. gallisepticum lessens disease on second exposure. But the greatest reduction in virulence and pathogen load was observed in birds who were first inoculated with a strain of higher virulence. In other words, infection with a more virulent strain provides the strongest protection of the host. This effect would, in theory, prevent low virulence strains infecting birds who had been previously infected with a low virulence strain. Would such a scenario select for strains of higher virulence? The authors addressed this question by mathematically modeling a two pathogen population. They simulated the invasion of a new strain into an existing population, and varied the virulence of both components. The results show that protective host immunity can select for as much as two times higher virulence, compared with a model in which no host protection arises. The authors have not demonstrated that increased virulence is a consequence of incomplete immunity, just that it is consistent with their experimental results, and supported by their modeling. I would appreciate future studies that identify the responsible mycoplasma mutations in strains of different virulence, the relevant functions, and how these are selected by incomplete immunity. I am also interested in understanding exactly what the authors mean by ‘incomplete immunity’. What is the ‘complete immunity’ induced by a virulent strain, and why can’t less virulent strains induce such a response? I also suspect that the situation is far more complicated in nature than it is in the laboratory, and that other factors might have influenced the selection of strains with increased virulence, such as host genetics, environmental factors, and transmission. Perhaps allowing birds to fly freely, and not be caged while infected, makes a difference. But remember that the virulence of M. gallisepticum will not keep increasing – otherwise all the birds and their mycoplasmas will be dead. Understanding how this balance is achieved is the key to understanding virulence. The authors make the very broad statement that “incomplete immunity should favor the evolution of greater virulence in any system in which higher virulence strains generate a stronger protective effect against reinfection than lower-virulence strains”. I am not convinced that this statement is universally correct. The poliovirus, measles, mumps, rubella, smallpox, and chicken pox vaccines are certainly less virulent than wild type strains, but they provide long lived protection and do not seem to have selected for more virulent viruses. That’s why they are good vaccine strains: they provide protection without causing the disease characteristic of the more virulent versions. I am also uncomfortable with the last sentence of the paper: “the same immune systems that evolved to protect hosts from infection can drive the evolution of more-harmful pathogens in nature.” I am always wary of predictions that apply to all infections. Perhaps such virulence evolution is a feature of newly emergent pathogens equilibrating with their new host. More studies of the evolution of virulence in different host-pathogen systems are needed before such a general conclusion can be made. You bring up a great point of the laboratories in perfect world. Do you think the more virulent strains would have been prevented infection by the less virulent strains?